Featuring an eclectic mix of some of the best Christian rappers on the scene, this remix is a monster of a track and 8 minutes of sheer brilliance. With a hook from British pop-star Ellie Goulding and JGivens’ Drake impersonation at 4:00 emphasised with the hilarious “Now Un-Drake!”, what’s not to like?! 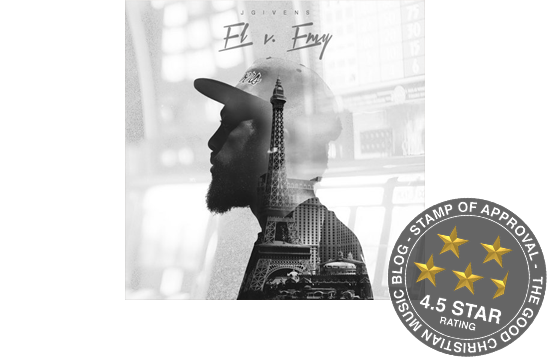 Straight out of Sin City (that’s Las Vegas for those not in the know), filling speakers with his grace-laced blend of electronic-infused hip-hop comes the brilliant emcee JGivens with his latest album El v. Envy. A double play-on-words, the title of the album itself is a reference to Las Vegas, Nevada (the acronym of which is LV, NV) and also El being one of God’s names revealed in the Old Testament and Envy representing the enemy. The first thing that struck me with this record is the electronica-influenced, west-coast style beats, tracks like Sin City Bre(a)d, The Bus Stop Song, The Pledge: “They Say” and _ _ _ End. It’s so common in Christian Hip-Hop to see beats that are copies of popular hits from yesteryear and that’s where so many artists fail – if what you’re doing isn’t new in the studio it definitely won’t be new by the time it reaches peoples’ speakers! However, on El v. Envy, I’m pleasantly surprised to hear beats that are new, and using a style that I don’t (yet) hear in mainstream music. It’s not just those massively-layered tracks that shine bright though, the other side of this record shows a much more mellow laid-back style hip-hop. Beats that usher in a memory or two of some of the classic G-Funk era tunes. Though on this record, it’s even more stripped back, leaning mostly on just bass and drums with the occasional extra instrument making an appearance. A key example of this is, is the track Can’t Say – a testimonial piece where JGivens shares stories of his time with our Christian brothers & sisters in Egypt and how they face persecution on a day to day basis. Other tracks in a simliar vein are Bienvenue and Stop Requested, though there are clearly still many G-Funk influences littered throughout the album. It may sound stupid but the truth is if I told you that truth / was an absolute and you said / “Dude, no it isn’t / ‘cos what’s true for you ain’t true for me because we’re different” / Then it’s tangible to see that that rebuttal’s a contradiction / Stating there’s no absolute truth is an absolute / so your own argument only disproves you! The only issue, if any with this record is that when JGivens is rapping over a trippy, synth lead beat and getting so deep into his message through complex lyricism it can sometimes create a competition between vocals and instrumental, with both demanded your full focus. EIther way, it’s not a huge problem, and by no means would I want the beats or lyrics to change, plus there are parts where the vocals and instrumentation meet perfectly despite said issue. Some great examples of which are perhaps Sin City Bre(a)d and and Stay Cool, and at it’s best it sounds like the chorus to The Bus Stop Song. This is the kind of record that’s so fresh it appeals to music fans regardless of their faith. When an album sounds this unique it’s not hard passing it on to non-believing friends (despite the gospel centred lyrics) because JGivens isn’t just a Christian version of a rapper they already listen to, he’s himself – and more importantly his style is his own as well. Hopefully, they’ll come for the music, and stay for the message. It’s been roughly three months since this album dropped so this isn’t exactly new but it’s given me time to fully appreciate it. Though by now that ‘new album’ shine has faded, what remains is a strong, intellectual, soulful, well-produced record, and in my honest opinion one of the best CHH releases of the year. On this track ‘Making Me More’ taken from his latest album Minorville, Derek Minor is joined by the brilliantly talented blues musician Mel Washington. By combining forces and genres, the two artists together have created a stompingly superb hip-hop anthem sure to grab the attention of many music lovers. Following the theme of the album, Derek Minor uses this track to be true to his fans and to show that at the end of the day he’s just another human with problems, hoping that Jesus is making him more. A well needed track for Christian Hip-Hop, where so often artists are put on pedestals by fans despite their honesty and humility in their music. Originally a solo Eons D track, the Louisville rapper writes that “this song was inspired by Romans 8:24-25. Psalm 37:7-9, Psalm 46:10, Psalm 40:1”. On this remix a number of other rappers (Deraj, JusThoughtZ, Jerrell Johnson and rapper/producer Knaladeus (listed in appearance order)) grab the mic to add their experience’s of being still and waiting on the Lord. This track is produced by Knaladeus, mixed/mastered by Israel Musiq and features piano from Alvin Trotman. After various solo releases from each party, Wes Pendleton & Tragic Hero joined forces earlier this year to release the mighty 7 track EP ‘The Resistance’. As the title suggests, Tragic Hero isn’t afraid to bring up social/political issues, however on the track ‘In My Arms’ he takes it a little easier, sticking to a story of a relationship struggling with various personal issues. With Tragic Hero’s smooth, carefully crafted lyrics combined with Wes Pendleton’s dreamlike beats, it’s the perfect recipe for a chilled track.